The break with Rome, triggered by Henry VIII’s desire for a divorce, was the first of a long series of events which created the Anglican church. The pace of change accelerated following the accession of his only son, Edward VI. In most medieval parish churches the chancel would have been separated from the nave by a screen, above which would have stood an image of Christ crucified, flanked by Mary and John, known as the rood, often with a loft or platform alongside providing access so candles could be lit. In 1547 all roods and their lofts had to be removed, together with all images and statues, both inside and outside the church. These very visible changes would have shocked and perhaps distressed many in the congregation. The access to the former rood can still be seen in many county churches, while others display empty niches, or have filled their niches with modern statues. These continue to provide a striking reminder of the sweeping changes that the Reformation imposed. The church plate, bells and vestments became the next target, and the lists of the possessions of the church that were drawn up for the king in the early 1550s provide a vivid picture of the wealth of parish churches in the 1540s. In the small village of Sproxton the church had three bells in the ‘stepyll’, a silver chalice, a vestment and cope of purple velvet, a vestment of red worsted and a cope of blue silk. In Melton Mowbray, the church where composer and conductor Sir Malcolm Sargent began his musical career as organist in 1914, the inventories record two organs there in July 1552, ‘in the Quyer on the South syde’. Anglican clergy were not expected to be celibate, and could marry and have families. This may have been a welcome change for many of them, but the income available to the clergy of each parish reflected gifts of land to the parish church in the distant past and whether the tithes had been given to a monastery, and therefore not only differed widely from place to place but was also frequently insufficient to support a clergyman with a wife and family. At Thurcaston, for example, the income was sufficient to attract a series of well-educated, able and ambitious men: two of the parish’s medieval priests and five of its subsequent incumbents were appointed bishop. In contrast, Queniborough was poorly endowed: the great tithe had formerly gone to Leicester Abbey and following the Reformation was now in lay hands, there was little glebe land and most of the small tithes had been commuted to cash sums which did not rise with inflation. The seventeenth century was as traumatic for the church as the sixteenth. The church at Little Stretton provides a rare county example of the oak communion rails that were favoured by Archbishop Laud in the 1630s. Others may have been lost during the Civil War, when Royalist clergy were dispossessed. The range of accusations levied against many Leicestershire clergy in 1646 vary widely, suggesting that these were not ‘trumped up’ charges to create a vacancy for a favoured supporter of the new order, but had a basis in the facts. Whether the vicar of Thornton at that time was a drunkard and adulterer, as was alleged, will never be known, but Queniborough was home to a wealthy Catholic family and it is well within the bounds of possibility that the vicar had baptised ‘a Papist’ in a Syston alehouse, as was alleged, perhaps taking a fee to supplement his meagre income. The Restoration of Charles II in 1660 brought the Civil War to a close and saw many churches needing to repair or replace fittings that had been deliberately broken or removed. In Shakerstone in 1662 the Bishop sought details of ‘who they were that threw down the fonte and brake the Church and Chancell windows … and burned the [communion] rails’. The window panes that had been broken presumably contained depictions of saints, and the destruction of the font had been required by an ordinance of 1643, although the number of medieval fonts that survive in churches across the county demonstrate that for many this was one instruction too far. The effects of the Civil War were still being felt in 1712, when a national collection was instigated for ‘Enlarging Coleorton Church & repairing it, the churchyard & Churchy[ar]d Wall & for Rebuilding the Parsonage house, w[hi]ch was entirely demolish[e]d in the Great Rebellion w[he]n the Church was made a garrison for the King’. The focus of Anglican services in the 17th and 18th centuries was the word of God, and the small church at Potters Marston, designed purely to be a ‘preaching box’, probably dates from this period. The main requirement of the wealthy for the longer sermons of this period was comfortable seating. 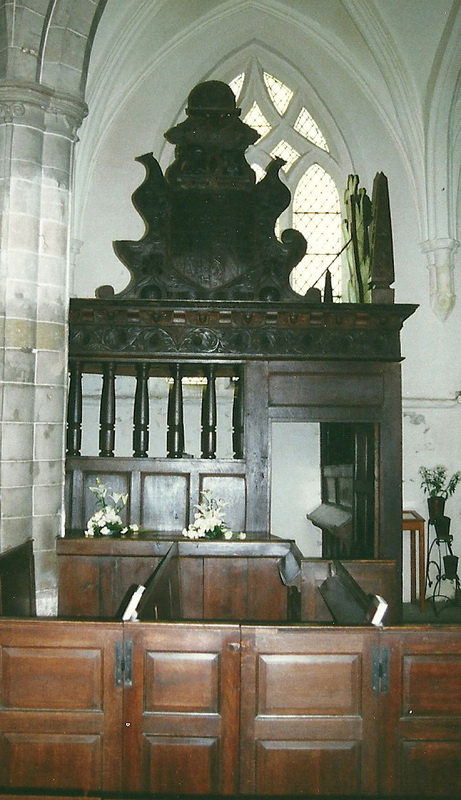 Following the Reformation, the Shirley family had appropriated the north aisle of the former priory church at Breedon-on-the-Hill, and in 1627 they added a family ‘pew’, a large piece of furniture that still sits behind the family tombs that came to dominate the interior of the church. At Stapleford, the family ‘pew’ of the Earl of Harborough even had its own fireplace. By the later Georgian period many of these individual seats had been replaced by uniform box pews to keep out the draughts, which were often assigned to families in exchange for a regular payment. A fine example of a Georgian church, with box pews and a centrally placed triple-decker pulpit with a reading desk and desk for the parish clerk (who led the responses and singing) can be seen at King’s Norton. Little more than a decade after the body of this church had been completed in 1761, the archdeacon ordered the removal of this pulpit, which was not to his liking, but thankfully the will of the parishioners prevailed. Music, which had played a part in medieval church life, became prominent once more in the Georgian church. 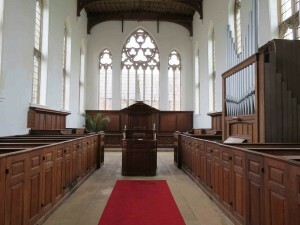 Galleries for singers began to be installed, usually at the west end, bands of musicians were formed (some of whose instruments can be seen today in the churches at Seagrave and Wymondham) and pipe organs were installed, such as the 1754 Snetzler instrument which can still be seen at Theddingworth. William Fortrey, who paid for the churches at King’s Norton and Galby, was clearly a music lover, providing an organ, a gallery and a peal of bells at King’s Norton, and a ring of bells and a carillon-type arrangement for ringing tunes on them at Stapleford. The early nineteenth century saw a number of new churches built, especially in Leicester itself and in the Charnwood Forest area. That at Groby, constructed in 1840, was one of the last in the county to be built with the tiny chancel favoured by the Georgians and a west gallery. Tastes were changing, and the focus was moving back towards the chancel (which had been largely unusued since the Reformation as most churches only had three or four communion services a year) and the Eucharist. In some churches, including Ashby Folville, Hoby, Mowsley and Seagrave, the medieval stone altar slabs (mensa) that had been broken and replaced by wooden tables at the Reformation were rediscovered and returned to the church. Steps were added in chancels to raise the east end, in a complete reversal of the policy of 1643 which had required any steps to be flattened. At Theddingworth, restored in 1858 by Sir George Gilbert Scott, the scheme included Minton tiles in the sanctuary, stained glass windows, a text around the chancel arch, decorative painting on the walls and a later font cover by Bodley, which rivals many of the elaborate medieval font covers of East Anglia. Most restorations were more modest in their decoration although often extensive in scope, such as at Anstey, where the church was completely rebuilt in 1845-6. Some restorations were essential, as ancient buildings had been allowed to deteriorate. The medieval fabric at Ratby had a lucky reprieve. In 1878 the north side of the chancel arch collapsed, bringing the roof with it. The architect recommended complete demolition and the Earl of Stamford and Warrington, patron of the living and lord of the manor, offered £1,000 towards a new building. 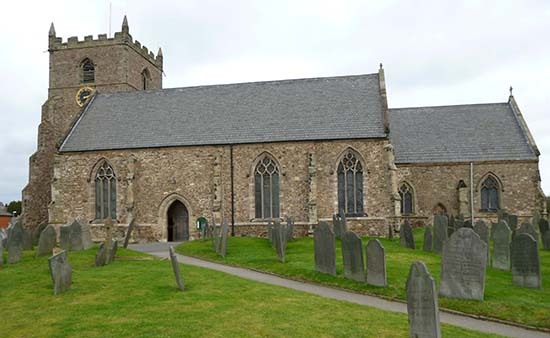 However, the parishioners refused and set about raising funds for the restoration of the medieval building, which was achieved and the church reopened in 1881, at a cost of £3,500. New churches of the late Victorian period include St James the Greater in Leicester, designed by Henry Langton Goddard and built in 1899-1901. Italianate in style, it demonstrates a firm move away from the Gothic style so beloved by the Victorians. Suburbs were also starting to appear, and new settlements, such as South Wigston, which grew from houses provided for brickyard workers in the 1880s, were provided with their own places for Anglican worship. 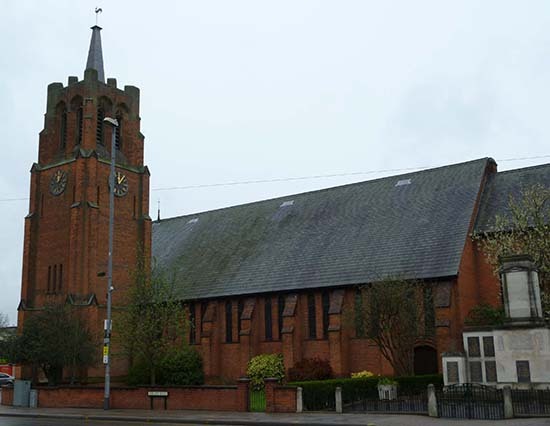 St Thomas’s church in South Wigston was built in 1893, perhaps inevitably from brick, and was largely financed by a large donation from Wigston solicitor Thomas Ingram. The tower and ring of eight bells he provided soon proved popular with campanologists, probably partly due to its proximity to a railway station. A peal of 17,104 changes of Double Norwich Court Bob Major was rung here in 1904, setting a record which stood for 60 years before being beaten in an 11-hour performance by a team of ringers in Llanfeugan, south Wales.